Outside fire pits are central features in sitting areas that add comfort and intimacy to social occasions. On cool evenings, they invite family and friends to gather around the crackling, popping flames. The warm glow of their toasty fires softly whisper to something deep and ancient within us all. They can be designed for grilling, or they can be used strictly for social occasions. Even when they are not set up for cooking, fire pits can still be used for making s’mores as well as serving as focal points of outdoor rooms. Our fire pit designs create in-ground garden features that evoke the communal warmth of a campsite fire without the hassle of traveling to a campsite. 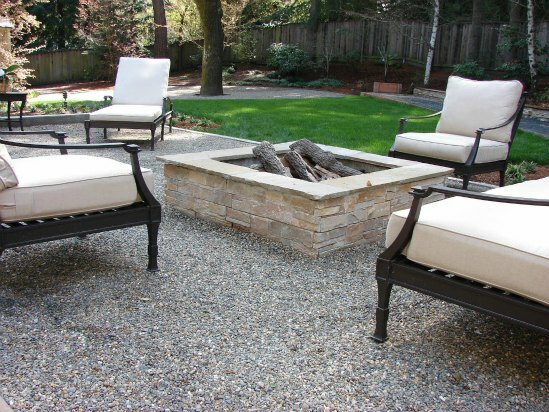 For aboveground units, our fire pit plans create attractive garden features that complement a yard even when they are not in use. They can be constructed with concrete, stone, or metal depending on setting and landscape design style. These versatile garden features can range in height from near ground level all the way up to tables with barstools that serve as outdoor kitchens. Wood, propane, or natural gas are the fuel options for our outdoor fire pits. We also install chimneas. Traditionally, chimineas were used as bread baking ovens in Mexico. Now these portable front-loading fireplaces have become very popular features in many gardens where they become magnets for guests to gather. 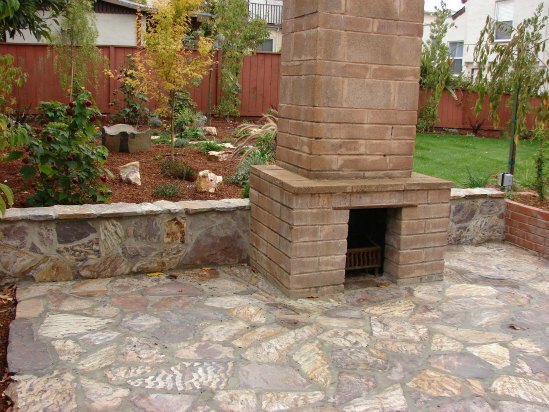 Chimineas can be constructed of ceramic materials, cast aluminum, or cast iron. These freestanding garden features use either gas or wood as their fuel sources. When the temperature dips in the evening, there is no need to cut short a great meal and head indoors. The warmth, light, and mesmerizing site of dancing flames in fire pits and chimineas allows an outdoor room to be enjoyed well into the night.